Managing your data on Android and transferring your files and contacts between different devices can be a real pain, especially if you want to transfer your files from iPhone to Android. But there is a solution that can do everything for you—AnyTrans for Android from iMobie. More than 10,000,000 iOS users already enjoyed an easier life with AnyTrans iPhone Manager, and now the popular data management service is available for Android users too. The software can be used on PC or Mac, on your Android smartphone or tablet, and even via a simple website. There are no annoying cables involved: you can remotely manage your phone and carry out data transfer over Wi-Fi. 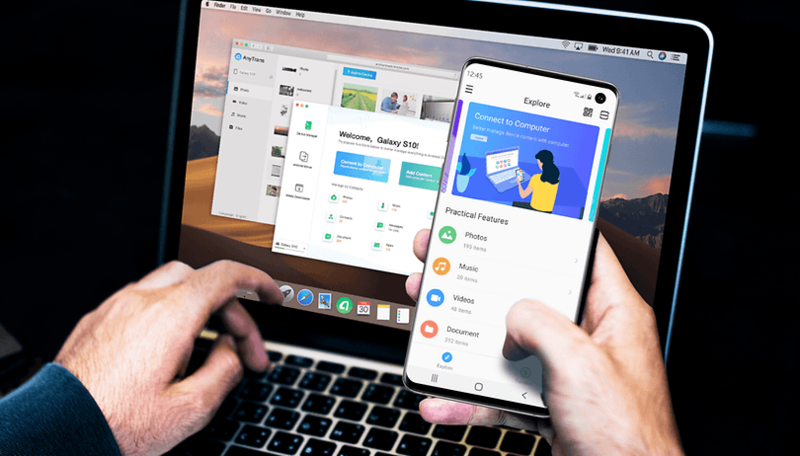 With AnyTrans for Android, you have the most convenient and in-depth file management system possible to search through and organize all your files, data and personal information exactly how you want to, including photos, messages, music, contacts, apps, and more. Wirelessly manage Android data and files from your home computer. Wirelessly transfer data between PC/Mac and Android device, or between iOS and Android devices. AnyTrans is also the perfect backup tool, allowing you to easily export sensitive data like your contacts, conversation history, text messages and photos to your computer to keep them safe. It's great for moving all your data to a new phone, and even works from iOS to Android. Switching from iPhone to Android? No problem! Changing mobile ecosystems is notoriously frustrating, but AnyTrans makes it easy. Move contents from iTunes library/iTunes backup and iCloud/iCloud backup to Android device over Wi-Fi with a few simple taps. Disappointed by the newer iPhones and switched to the Samsung Galaxy S10 this year? AnyTrans can transfer all your text messages photos, contacts, apps, videos, music, call logs, documents, ringtones, calendar, books and so on from your iPhone to your new Android securely and easily. Want to fill up your multimedia library? You can directly search for your favorite videos and songs in AnyTrans and then download online videos or audio from more than 1000 websites to your Android or PC/Mac in your preferred format and quality, and store them for offline use later. There are several ways to use AnyTrans for Android, just pick the one that is most convenient for you. AnyTrans for Android is currently available with a $10 discount from the iMobie store. Want to try the AnyTrans App on your Android phone or tablet? Get it here on the Play Store. For more powerful features, download AnyTrans for Desktop. You can launch AnyTrans right from the website, no need to install anything! Have you tried AnyTrans for Android? What do you think of it?